Play. Pause. Shuffle. Or skip to your favorite song. 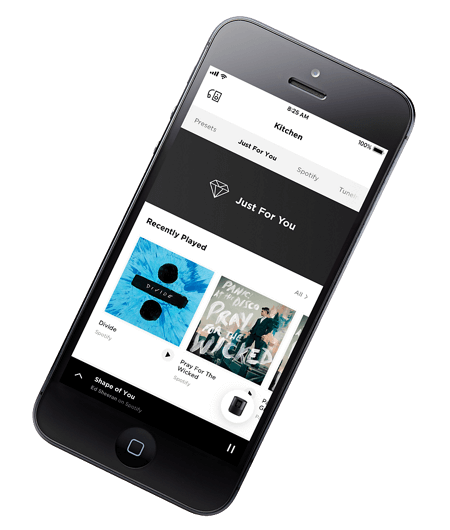 You’ll have millions of playlists, albums, and more at the tip of your tongue. With Alexa built in, you have access to things like weather reports and news headlines, too. So if you want to hear something, just ask. And future software updates will add new features. Turning the music up at a party? It’s not a problem for our voice pickup technology. Just under the surface is a custom-designed eight-microphone array, so the speaker still hears you, even when it gets loud. You can turn off voice access whenever you want, too. Just tap the mic-disable button to cut power to all microphones, and continue to access the other features of the speaker. The Home Speaker 500 looks as good as it sounds. A seamless, anodized aluminum body gives the speaker a refined finish that’s perfect for any room. The Bose Home Speaker 500 is part of a new family of smart speakers and soundbars. They all work together, so you can add another whenever you want to enjoy more music in more rooms. And with Alexa voice control built in, you have millions of songs at the tip of your tongue. Or, you can manage everything from the Bose Music app. Bring all your entertainment to life — music, movies, and TV — in any room you want. Can the Bose Home Speaker 500 work in multi-room groups? Yes. 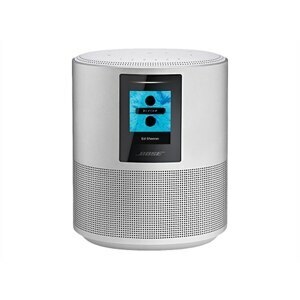 The Bose Home Speaker 500 can play in synchronized multi-room groups with additional Bose Home Speaker 500 units, or with the Bose Soundbar 500, or Bose Soundbar 700. However, you cannot play synchronized multi-room content across the Bose Home Speaker 500 and either Bose SoundTouch products or products from other manufacturers (including Amazon). No. The Bose Home Speaker 500 uses the new Bose Music app for setup, control, and music browsing, while Bose SoundTouch products use the SoundTouch app. The Bose Home Speaker 500 works in synchronized multi-room groups with any combination of additional Bose Home Speaker 500 units, the Bose Soundbar 500, or the Bose Soundbar 700, but it does not work together in multi-room groups with SoundTouch products. 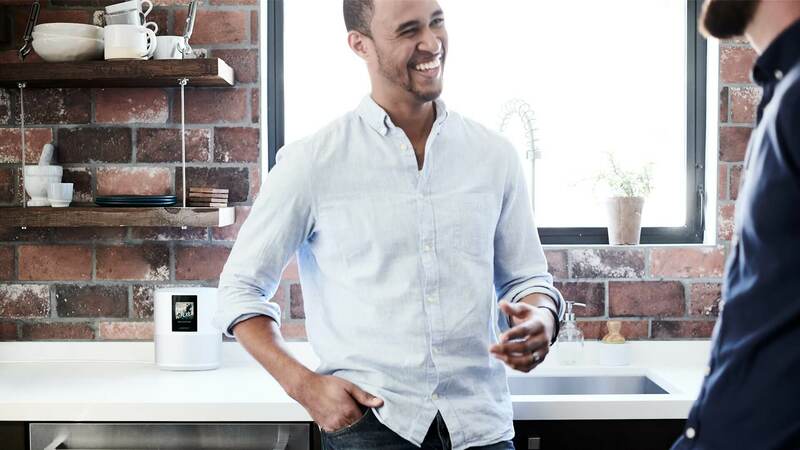 The Bose Home Speaker 500 can play music directly from streaming music services over Wi-Fi®, controlled either by Amazon Alexa (where available) or using the Bose Music app. The Bose Home Speaker 500 also has Bluetooth® capability and a standard 3.5 mm auxiliary line-in jack. Additionally, you can play music on the Bose Home Speaker 500 from the Spotify® app on a smartphone, tablet, or computer using Spotify® Connect. And coming soon: Apple AirPlay 2 compatibility for streaming content like Apple Music from Apple devices. Yes. Apple Music can be accessed over Bluetooth, and Apple AirPlay 2 compatibility is coming soon. You can initiate and control content on the Bose Home Speaker 500 using the Bose Music app, the buttons on the speaker, or with your voice (via Amazon Alexa, where available). You can also control the speaker using Spotify® Connect (through the Spotify app). AirPlay 2 compatibility for added control from Apple devices is coming soon. 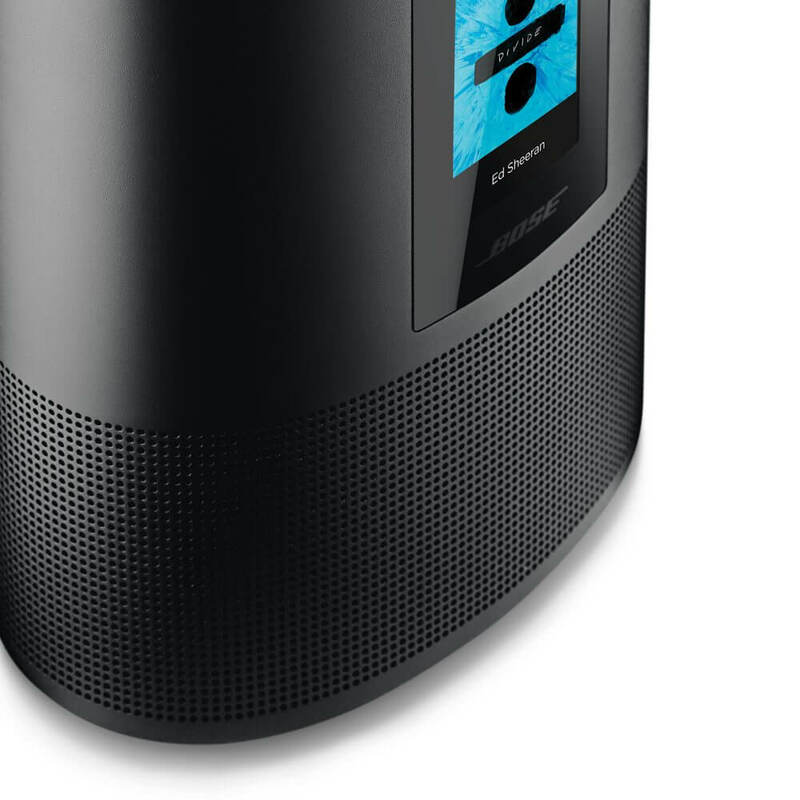 The microphones on the Bose Home Speaker 500 may be turned off with a single tap of the microphone off button on the top of the product (on the lower left). This button completely cuts power to the microphones so Alexa will not hear any commands. For security reasons, it is not possible to use a voice command or the Bose Music app to turn the microphones on or off — only a physical button press can control the microphones. When the microphones are off, this button will always be backlit with a red LED light. Yes. 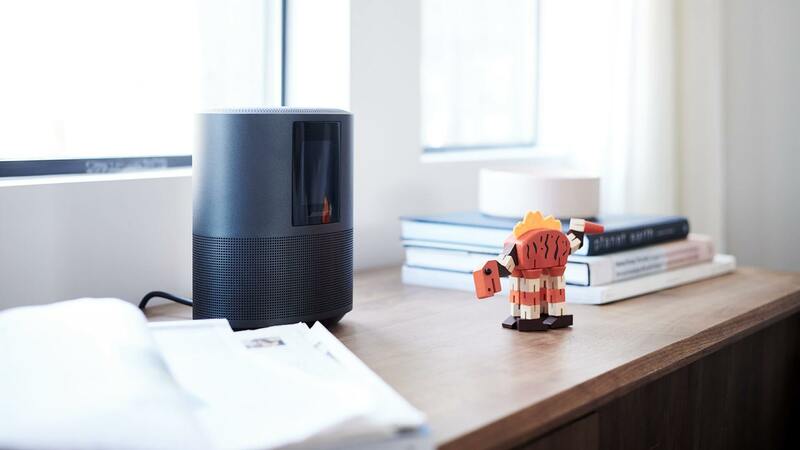 Although the Bose Home Speaker 500 has Alexa built in, you can also play music from non-Alexa sources, such as integrated Wi-Fi music services available through the Bose Music app and the preset buttons on the product. You can also use a Bluetooth or auxiliary connection. All of these non-Alexa sources are available independent of whether the microphones are turned off or whether Alexa is installed. The light bar, located just above the LCD display on the front of the product, shows animations to indicate Alexa behaviors (such as listening, responding, etc), status indications (starting up, downloading, and installing updates; Bluetooth connecting; button presses), and other states. 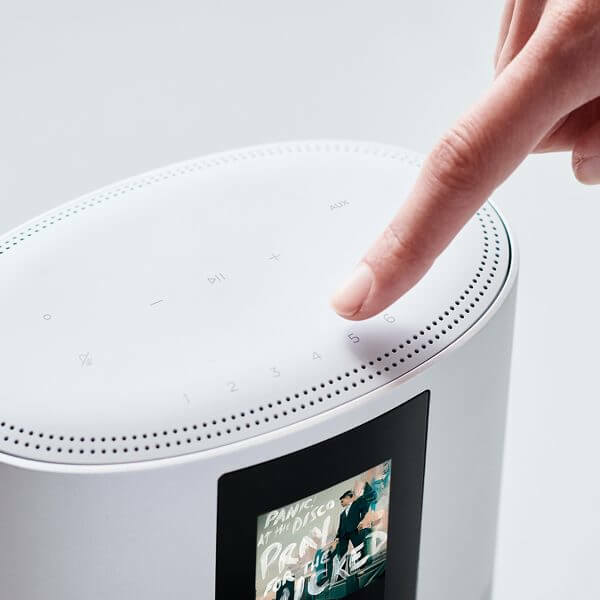 It is not possible to provide a comprehensive list of supported features, because Alexa is constantly evolving — but the integration of Alexa with the new Bose family of smart products will support the vast majority of Alexa functionality, including music playback, control of smart home devices, setting timers and alarms, and general information requests. Yes. The various Alexa Skills’ smart home device control abilities work on the Bose Home Speaker 500: for instance, “Alexa, set my smart thermostat to 72 degrees” or “Alexa, turn off the lights”. Can I play multi-room synchronized music on the Bose Home Speaker 500 and another Amazon Alexa product, like an Amazon Echo? No. 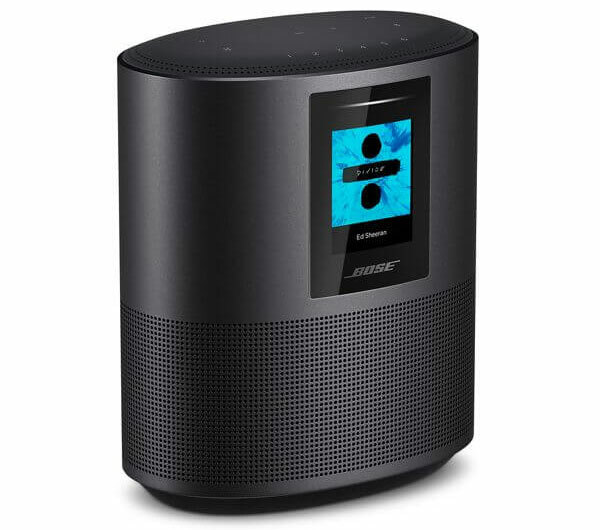 The Bose Home Speaker 500 can play in synchronized multi-room groups with additional Bose Home Speaker 500 units or with the Bose Soundbar 500 or Bose Soundbar 700, but cannot do so with non-Bose devices. However, between the Bose Home Speaker 500 and native Alexa products from Amazon, you can ask one device to play music on another device individually by name. For example, if you have an Amazon Echo Dot in the living room and a Bose Home Speaker 500 named “Kitchen” in the kitchen, you can ask the Echo Dot: “Alexa, play the Beatles in the Kitchen.” Or you can ask your Home Speaker 500 to play music on an Amazon Echo elsewhere in similar fashion. It's powerfully simple. The Home Speaker 500 looks as good as it sounds. A seamless, anodized aluminum body gives the speaker a refined finish that's perfect for any room.